Yep, sure is... and I know there are *loads* of events happening all over the country. 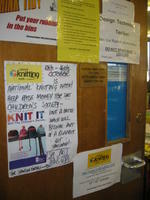 Now, I've been organising a few things meself in school, linking in with the Children's Society 'Knit It' campaign. As you can see from the door of our Textiles classroom, I've tried my best to raise interest! I haven't really got time to teach the kids to knit on a big scale, so have focused most of the fund-raising at the staff. Last friday lunchtime I had loads of teachers knitting in the staffroom, including many beginners and it was great! Wonderful to see so many people supporting the campaign. But I didn't have my camera. Today I did have, but some little brat set off the fire alarm just before lunch and we all lost nearly half an hour of our break - barely time to eat let alone knit or relax. So it's been one of those days. Actually, I'm knackered. Meantime, I need a nap. Am exhausted.